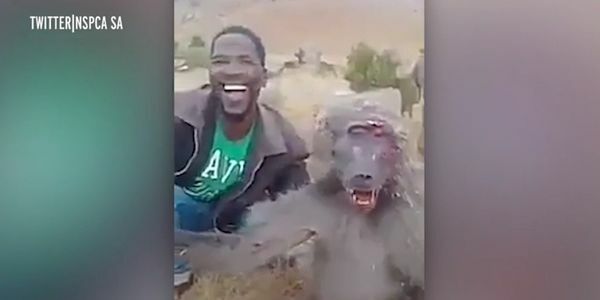 petition: This Guy Filmed Himself Taunting a Dying Baboon. He Must Be Found. This Guy Filmed Himself Taunting a Dying Baboon. He Must Be Found. Baboons have had a hard year. In October, an Idaho Fish and Game Commissioner bragged online about killing a whole family of baboons. He accompanied the post with a photo of four dead apes — young and old — posed in front of him. Now, one month later, a disgustingly cruel video has gone viral worldwide showing a hunter, taunting a badly hurt baboon. The man poses next to the monkey which is barely holding on to life. It gasps for air while the hunter holds him by the arm and laughs and smiles. The poor baboon's confused anguish seems to egg the hunter on. As if it couldn't get any worse, at one point, the man tells the poor animal to "stop complaining" and asks "does it hurt?" There is no need for this cruelty. No one knows the fate of the baboon, but considering that experts believe that it was injured in a hunting exhibition, it is quite likely that it died. Now authorities are looking for the person responsible for this barbaric act, so he can be charged with animal cruelty. While the story is in the news, government officials will likely pay attention, but these days, news cycles are short and people's memories even shorter. It is important that we keep this story on the minds of the people who could actually find and punish the perpetrators. So please sign this petition, and tell South African National Parks to do all they can to find the people responsible and bring them to justice.